I eat Big Data for breakfast. Half artist and half analyst, I’m an interpreter bringing creative and quantitative to pattern recognition and predictive analytics. Currently Managing Director at Briarcliff Capital, an agile research and consulting firm leveraging Big Data expertise within technology, healthcare, financial, and economic domains to uncover and interpret discrete patterns and manufacture the break-through ideas and investments that change individuals, institutions, and industries. First quarter economic performance will be bad. Every. Single. Year. With the market already blaming the "Blizzard in Boston" and a "Polar Vortex," I figured they've now run out of excuses. This list should cover them for the next 27 years. Forget the Ingredients, It's the Economy, Stupid! The Street is alive, with the sound of money. With trades they have made, for a thousand years! Personal startup experience, and a warning to aspiring entrepreneurs and those who fund them. While many people can’t articulate it, the organic groundswell of this protest movement can be traced to a universal sense that a great injustice has been done to “the 99%” since the recent financial collapse. Markets At Risk As "Tepid, Uninspiring" G20 Proves Investor Hopes Were "Pure Fantasy"
Good article but GREAT picture - worthy of its own meme, and begging for subtitles of what Janet Yellen is thinking. I'll get us started... "It's Middle School all over again." STEManifesto: Want To Fix Education And STEM Skills Gap? Give Up! "According to the U.S. Department of Commerce’s Economics and Statistics Administration, growth in STEM jobs was three times greater than that of non-STEM jobs over the past decade. 71 percent of all jobs in the United States will require STEM skills by 2018 and, today, there is one unemployed STEM worker for every two STEM job openings." So, when 71% of ALL jobs in the U.S. will require STEM skills within 3 years, it doesn't take a mathematician to figure out where our educational priorities should be. My position is that we focus on tackling this big "solvable" problem first, and then take aim at the smaller - yet very real - issues you mention. Who knows, if we do it right, maybe STEM grads will perfect a robot to brew those beverages for you! Robots About To Take Away 18 Million German Jobs, 59 Percent Of Germany's Work Force? Great research and a timely article. 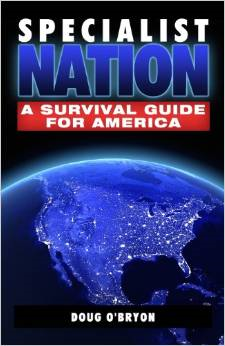 In my 2012 book "Specialist Nation: A Survival Guide for America," I discuss the impact of robots, and introduce the concept of the "Productivity Dividend" - concluding that whether machines are viewed as "good" or "bad" depends on how the world invests the millions of suddenly available human resources. Excellent piece of word art! Elegant, insightful, and riddled with relevant metaphorical references from the Torah to the Titanic. Great mix of style and substance, and the spectacle that is financial theater. Sears FINAL Earnings Call Rehearsal – SECRET TRANSCRIPTS LEAKED! WARNING: Sears NEXT earnings call will be their LAST! Enclosed are the leaked SECRET TRANSCRIPTS from the earnings call rehearsal one week before they pull the plug on this American icon. Description: Briarcliff Capital is an agile research and consulting firm leveraging Big Data expertise within technology, financial, and economic domains to uncover discrete patterns and manufacture the break-through ideas that change individuals, institutions, and industries. Current responsibilities include serving as head strategist, industry research lead, and principal-level client liaison for managing projects - assuring timely completion of milestones and compliance with contract deliverables. Description: Lead executive directing enterprise-wide content, brand development, and resulting strategic planning initiatives for corporate social media consulting firm DemingHill. Rewrote business plan, authored new website content, repositioned online/offline strategy documents, and composed supporting marketing collateral as part of a complete corporate rebranding initiative. In his fourth ”" and most ambitious ”" book to date, cultural anthropologist and economist Douglas O’Bryon pulls no punches as he pulls back the curtain on offensive coordinators, admissions counselors, Human Resource managers, and even the Harvard Business Review, in an ambitious, impassioned charge to protect America’s future by embracing a national brand message and accelerating our transition from generalists to specialists. bodybuilder and businessman, entrepreneur and everyman, soccer Dad and MBA grad, he is a realist, idealist, and surrealist, who considers his job done when he has blended high tech with high touch into an easy to swallow Digital Casserole, which is, ironically, also the name of his blog. He is currently working his new novel, a sequel to The Titanic.